This elegant small ornamental tree with delicate, mid-green foliage, developing a rounded head of branches makes the perfect garden feature. The Pink Acacia tree produces fragrant, pale pink/lilac flowers that are borne abundantly in June against the pinnate, summer foliage. These attractive pea-like flowers hang in racemes along the branches. 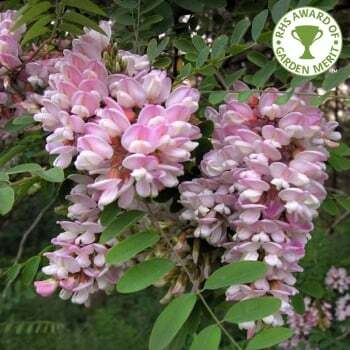 Robinia Pseudoacacia Hillieri is a tough tree, tolerant of drought and best suited to a sheltered position in full sun or dappled shade and particularly benefits from being sheltered from cold winds. This Pink Acacia Tree will grow to 6 x 4 metres in 20 years. This variety has the RHS Award of Garden Merit but it is fairly unusual - only small numbers of this lovely tree are produced each year. Robinia pseudoacacia (false acacia) has a great pedigree. It was named by Carl Linnaeus in honour of the French botanist Jean Robin and his son, royal gardeners to Henry IV of France. When planting Pink Acacia trees, such as Robinia Pseudoacacia Hillieri, it is important to prepare the planting area well. Pot grown robinia trees can be planted at any time of the year. You will need to carry out the following to prepare your planting site. If your soil is poor, mix 50% of the original soil with 50% high quality compost, fill in the hole and firm around gently. Make sure not to bank the soil up around the collar of the tree as this can cause problems. To see how to use a tree stake and tie, watch our informational how to videos. Robinia trees do not require regular pruning. To tidy up your pink false acacia tree, you can remove any crowded or damaged branches in mid-summer, this will give enough time for the wounds to heal before the frost arrives. Make sure to wear protective gloves and long sleeved clothing when pruning robinia trees.